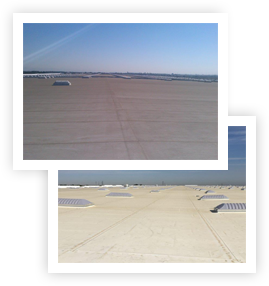 Extend the life of your roof with simple, low-cost maintenance solutions. A bi-annual, seasonal service program for your roof is important to its performance and longevity. Neglected roof debris like trash, leaves, and spilled chemicals can cause damage to both the roof and other roof-related elements such as decks, drains, gutters, penetration flashings, and mechanical equipment, all of which are costly to repair or replace. Roof system manufacturers advise that a properly maintained roof will extend its service life and meet the manufacturers NDL warranty requirements, so a roof maintenance program makes good financial sense. Call CRC Roofing for a competitive maintenance service quotation. You will be pleased with our service, and will gain the peace of mind that comes from knowing you roof is in tip-top shape.